The Legend of Tarzan was a animated television series that spun off the successful animated film Tarzan. Can't say I'm a huge fan of the Disney version of Tarzan (I can say I am a big fan of Tarzan in general, however), I do appreciate the writers of the series mining actual Tarzan mythology as a source for the series. For such a relatively mainstream format to reference Pellucidar as they did, is awesome and unique. Tarzan visited Pellucidar in Edgar Rice Burrough's novels. It was the one book that crossed the Tarzan series with the David Innes Earth's Core series. Tarzan at the Earth's Core was the 13th Tarzan book as well as the 4th Pellucidar book. This episode does not reflect that plot as David Innes, Abner Perry or any native humans appear. To be knit-picky, though, there remains a lot to be desired on how they did it. The scene in which Tarzan and the Porters enter Pellucidar is a bit disappointing in that they climb down a rope. I believe there is about 800 miles of earth between the surfaces. About midway gravity shifts it's pull. So they should've climed down out of the outer-world and up out into Pellucidar (which would be impossible with a rope- even if you 800 miles of rope). This episode glosses over that with the valuable little time to tell the story the have instead of using that time to educate the audience on the science of a hollow world. Their focus was the existence of dinosaurs. How they get there was minor. Wider shots of the background revealed what I originally thought were floating islands, but I believe were supposed to be stalactites, establishing Pellucidar to be a huge cave instead of the established setting. It's a children's show and they're forgiven for just writing the setting into the episode. Included is the Phil Collins theme song. 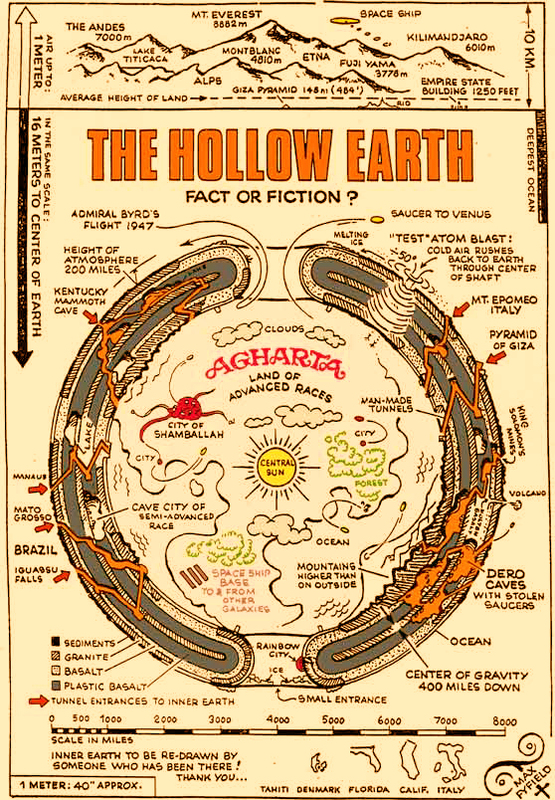 Pathfinder's world, Golarion, is hollow just like TSR's Mystara. Dungeons & Dragons' setting of Mystara was given the hollow world treatment with a box set and a few modules. 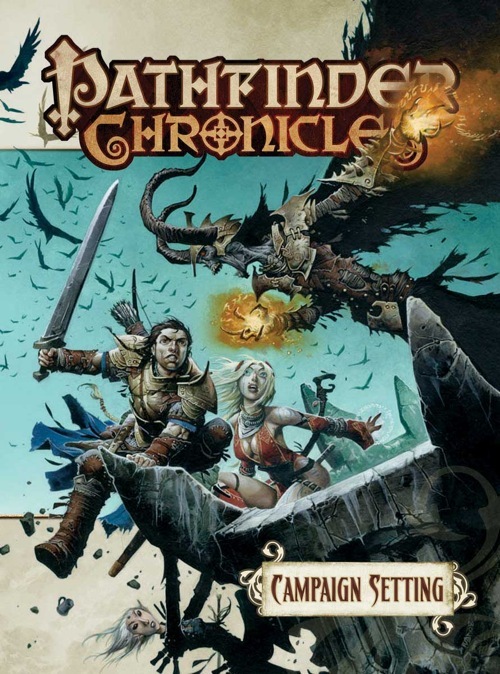 It appears Paizo's setting for Pathfinder may someday receive a similar treatment. "Incredible rumors suggest that the beasts that make the realm famous somehow emerged from an impossible underworld with its own false sun, a savage microcosm in which the dinosaurs never died and humans never emerged from their primitive origins. The Pathfinder Society has mounted five expeditions to this rumored inner world, but none of (sic) have ever returned from the country alive." "Some are said to be so huge that they are themselves inverted worlds, that the denizens walk and live along the inner surface of the vault in defiance of gravity, and that their skies are lit by a glowing orb of brilliance akin to the sun itself floating at the immense cavern's center." As a fan of the D&D Hollow World setting, I really hope to see more of the inner world of Golarion developed. We'll be watching for it. Travis Morgan teams up with Supergirl, Stargirl, S.T.R.I.P.E. to liberate Skartaris from Deimos. I've always been impressed with the quality of JLU. Even more so that they dedicated an episode to the Warlord title. This episode originally aired in September, 2005 in Justice League Unlimited's 2nd season. It also features Metallo and Silver Banshee. According to Wikipedia, the original title for it was Heart of Stone. 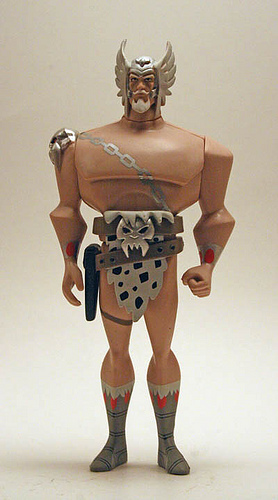 Warlord and Deimos action figures appeared with Supergirl in three pack for the toyline attached with the animated series. See more pictures at CoolToyReview.com. It looks pretty cool, but the lack of sword, shield and .44 is pretty disappointing. 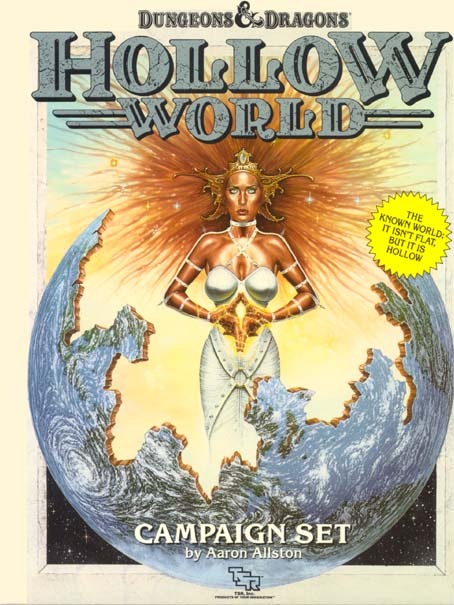 This blog is intended to follow and report on media that feature hollow planet settings. 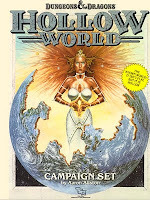 Initiated with the love of Edgar Rice Burrough's Pellucidar books and DC Comics' Warlord series, this author really likes the idea of the Hollow World.